All of our in-house EPS scraps and excess trim are reused in our manufacturing process. 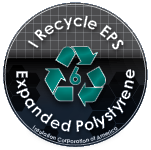 We also accept clean, recyclable EPS from our customers as well as from the public. Rather than see it go to a landfill, these EPS remnants go through the grinder while beads and dust particles are separated. The beads are then reincorporated into the EPS production process to make more EPS blocks. The captured dust particles are densified into cubes which are exported and eventually used to create other objects such as picture frames, etc. Installed in 1994, our pentane collection system offers an environmentally friendly process that traps the off-gas from when we steam our beads so that it does not enter the atmosphere, reducing the amount of potential pollutants released into the air. 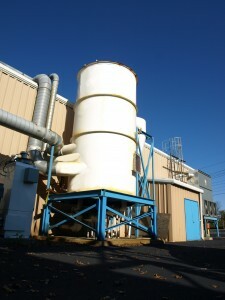 We recapture the excess pentane from our manufacturing process and reroute it through our boiler. 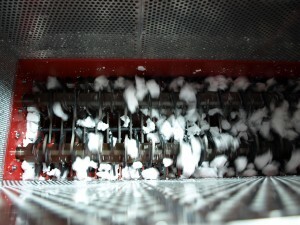 The collected gases get burned in our boiler, creating more steam and thus more energy power for our plant. This process greatly reduces the amount of natural gas we use. 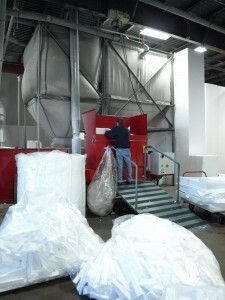 At ICA, we also recycle the packaging that our raw materials come in. Supersacks, corrugated boxes, and plastic bags are all, respectively, compacted into bales and sold for recycling. This recycling process has tremendously reduced our waste as well as our dumpster costs. The solar panels we have installed on the roof have significantly reduced our electricity consumption. All of the lighting throughout our building has been replaced with energy-efficient bulbs. We also have automatic motion-sensored light switches in our offices which conveniently regulate our lighting usage. In addition to all of these green tactics, we also recycle our office paper and other scraps as well as recapture some of the excess water that occurs during our manufacturing processes to recycle and use for further use. All of these actions help to keep the air of our planet cleaner and lessen the impact of landfills on the population. At ICA, we take environmental consciousness very seriously and take great pride in our efforts towards a green living and working environment.